JOIN US for an evening of celebration, expression and connection. • DRIFT in and out of magical Mbira music world while you enjoy your mocktails and connect with friends old and new. • WOKE your awareness with spoken word artist Emily Duffy and her performance of ‘Matrilineage: Amplifying Women’s Voices’. • MOVE with the iconic anthems of the P.o.P. Resistance Choir. • SING your heart out with guest artist Nii Armah Sowah & The 1000 Voices Project. 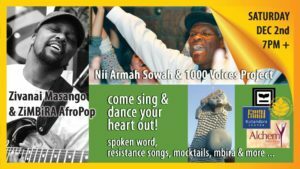 • DANCE the night away with visiting artist Zivanai Masango & ZiMBiRA AfroPop. $10-$20 sliding scale, kids free. Hospitality: The WishCart will be offering Mocktail pairings of Rowdy Mermaid Kombucha & WishGarden Herbal Boosters. Ice coolers will be provided for BYOB … and more! A big thank you to sponsors Alchemy of Movement, Rowdy Mermaid, Kutandara Center & WishGarden Herbs.